A collection of stories set mainly in the fertile imaginative landscape of the American West, written with the terse lyricism, cinematic detail, and wry humor that have become Sam Shepard’s trademarks. The New Yorker - September 21, 2009 - "Land of the Living"
The Paris Review - Fall 2009 - "Four Days"
Zoetrope - Fall 2009 - "Thor's Day (Highway 81 North, Staunton, Virginia)"
The New Yorker - November 23, 2009 - "Indianapolis (Highway 74)"
"Day Out of Days," is a collection of 133 stories and other ephemera that remind one of Flannery O'Connor's writings, only with a Western twang. A series of haunting tales of Americana narrated by a lonely traveler along various forgotten highways are interspersed with reminisces, poetry and unconnected historical tidbits about Casey Jones, Willie Shoemaker, Fats Domino and Hank Williams. Some of the stories make you stop and say "wow." Others read as though they were written in a peyote-high stream of consciousness. And some provoke unpleasant images... But soldier on. Shepard takes us where, at one time or another, we have all been - or will be... On the surface, this book might seem like a paean to Jack Kerouac, but it's pure Sam Shepard, "somewhere suspended in time." interior monologues begin reflecting on family and children and regrets, we listen - because it is as though Shepard himself is speaking. Read full review at this link. "Day Out Of Days" conjures up such a sense of a lonesome world of men and women who are just trying to put one foot in front of the other, all while walking a long, dusty highway, that it’s impossible to not fall under its thrall for at least a little while. It may work best as the kind of book you pick up and read a few pages from, then put down again for reflection. It’s hard to regard "Day Out Of Days" as anything like a traditional short-story collection, but as a collection of tiny jewels of language unearthed with great care by a man with a uniquely American voice, it’s unlike anything else. Ever since leaving home as a teenage tenderfoot, Sam Shepard has been chasing a dream as old as America: the promise that if he just keeps moving, he'll eventually figure out where he is going. Fifty years down the line, Shepard's fourth and darkest collection of stories, poems and reflections suggests that he - or a narrator whose biography bears an uncanny resemblance to Shepard's own - is still searching, even as he increasingly wonders whether there's anything worth finding. Shepard - who came to the world as the American version of a post-Beckett playwright and turned into a magnificent screenwriter (Wenders’ “Paris, Texas”) and, by dint of lanky and rugged good looks, movie actor - calls the contents of his book “stories,” but they’re far more varied than that. You’ll find slices of autobiography, prose poems, conventional poems, sketches, fables, jokes, all manner of fugitive highway scraps from a literary mind as distinctively lit as T.C. Boyle’s - and just as endemically American. From Charles Frazier’s "Cold Mountain" through Cormac McCarthy’s "The Road", the road remains a potent reality, metaphor and symbol in the American literary imagination... Although the book is subtitled Stories, there are few short stories in the conventional sense of the term. Instead, there are fragments of scripts, dramatic vignettes, narrative snapshots, cinematic snippets, song lyrics, poems, laconic jokes, interior monologues - many less than a page in length - in addition to longer pieces. The book’s various narrator/protagonists make up a kind of composite representing the Lost Soul of America, who is on the road, endlessly wandering its highways and byways in search of meaning and purpose. With "Day Out of Days", Shepard writes himself into the very fabric of the Myth of America, no longer a pastoral dream but an apocalyptic nightmare. "Day out of Days" reads like the scrapbook of a singular mind, filled with wry humor, startling observations about human nature, and plain glorious weirdness. Shepard writes each piece with poetic concision and an intimate level of gritty detail that indicates the Pulitzer-Prize winning playwright and Oscar-nominated actor has not isolated himself from the world. The book's structure is as free as the open road, with poems and dramatic dialogues scattered in among the stories, but a few landmarks recur... This is a road trip of the spirit through the American West, a book that should cure anyone’s mental rut with its quirky tales and unexpected observations. In this collection, Sam Shepard has proved himself an enormously inventive writer, working in territory that seems familiar, but that proves to be surprising and revelatory. Gripping and elusive at the same time. The collection is something like a dream diary (with plenty of nightmare thrown in), with many stories filling no more than a page, some taking the form of list-like poetry or spare stage dialogue... And there’s something about Shepard that invites awe. Sam Shepard is Samuel Beckett as Marlboro Man. Dude deserves to be called “chiseled.” With his bare-bones prose. His rugged peculiarly American absurdist-nihilistic outlook. The bite-size form brings to mind the ultra-short fiction of Japanese master Yasunari Kawabata’s Palm-of-the-Hand Stories, but the tone is one of damaged American manhood — by turns tough, smart, taciturn, funny and self-reliant, but totally f**ked up. Readers of Hemingway, Cormac McCarthy, Jim Harrison and Thomas McGuane will recognize the type. On the surface, Sam Shepard’s latest collection of short stories is a road trip. But just on the surface. Dig a little deeper. These stories don’t follow any traditional route. They wander from town to town, and are sometimes surreal, sometimes touching, often macabre. Some are very short, some not so much. There are random fragments, rants, the occasional monologue, some poetry, and stories from the past... Shepard’s writing is compelling. With the artistry of a craftsman, he drags his readers in and holds them, page after page. Staccato sentences mark his aggressive, hard-edged style. In tales and reflections that range in length from a paragraph to several pages, the celebrated playwright/actor takes us on a journey down a long boulevard of broken American dreams. The often itinerant characters can take on traits of their famous author, but Days is too expansive and too rich in mythical, at times surreal imagery to suggest autobiography. With scenarios that are at once unbearable and irresistible, Shepard casts a predictably haunting spell. Sam Shepard has made a name for himself as a writer who derails and debunks the many myths we have about the West. In his works, he often suggests that longing and heartbreak are better than not feeling anything at all. He instills his work with dark, wry humor, perhaps to help us digest it, and because sometimes the really weird, scary, and harmful things that he writes about are very funny. There's a line in one story that sums up the entire collection of stories, dialogues and notes: "The way people just keep living their lives because they don't know what else to do." They are sad people. They don't know it, of course, because they don't even seem to know what is going on around them, let alone inside them. By the end, the book comes full circle and it all makes sense. This is Shepard's brilliance — the ability to continually surprise us. He plays with our heads, pushes boundaries, and in the end makes the journey worthwhile. Torn between the clarity of linear narration and the pleasures of obfuscation, between self-satisfied self portraits of a bronco-riding intellectual and surprising sketches of a flawed and aging narcissist, and most of all, between a Bohemian life on the road and a powerfully compelling domestic life, the narrator talks out his conflicts on these pages, often with great precision and beauty... This present collection demonstrates that he (Shepard) is still genuinely an outsider, confused by and resentful of his worldly success, and still restless - a cowboy on an endless drive in an old Chevy. The central character, on the road throughout these stories, is not always the same man, but he has a consistent, familiar voice. As in Shepard’s earlier collections, these fictions tease, toying with autobiography. The main character shares plenty with the author. "Day out of Days" won't re-brand Shepard as a fiction writer. But the eclectic collection is often powerfully entertaining, and it adds another coat of varnish to Shepard's enigmatic persona, which rests on a mix of rugged good looks, existential angst and lost-to-the-road loneliness. There's an elegiac quality to many of the stories: Some are mere fragments, poems or just snippets of dialogue; all of them are helped along with a large dash of the kind of autobiographical detail that fairly begs the reader to ask: Who is Sam Shepard?... For Shepard fans, these stories tread the familiar ground of a romanticized, dystopian American West — only now it has been updated for the cell phone era. For Sam Shepard, the prizewinning playwright and short-story writer (and sometime Hollywood actor) whose work might be characterized as Grass-Roots Gothic, infused as it is with a sense of folksy madness and populist brutality, the American landscape is a sprawling cemetery, a field of bad dreams spread violence that seem to repeat themselves through the generations in a cruel infinity loop, consist of dark highways stretching to the horizon. Under them lies a dense matrix of remains. The bones of Plains Indians, Confederate soldiers, hard-luck homesteaders and hellbound drunks mix in a democratic necropolis capped by thousands of miles of oily blacktop. These routes, which for some writers promise liberation — an escape into unbounded freedom and possibility — are, for Shepard, roads of no return. Laid out north and south and east and west, they all lead in the same direction: down. Shepard’s book has no normal beginning, middle and end. Its structure is not sequential but vertical. Using fanciful anecdotes, lyric riffs, seemingly lifelike reminiscences and quotes from our nation’s founding thinkers, he drills down through the strata of our history into the bedrock of American myth. He sinks his wells at random, in offbeat spots, taking core samples from all over the country that often contain fossils of shared experience, some of them heavily crusted over with legend. His words have a flinty, mineral integrity, especially when he describes the people around him, who come off as distinctive individuals but also have an enduring archetypal feel, like the iconic figures in Whitman poems. His crackpot vagabonds, working-class survivors and footloose fellow wanderers have been with us always and probably always will be. Their names may change over time but not their souls, which eventually form the ground we’re forced to cover us as we fan out to seek our fates. But their moans are still audible over our engine noise — if we only slow down enough to hear them in the way that Shepard does." This might be the best moment to introduce our author, Sam Shepard, the celebrated and prolific American playwright slightly less known for his books of prose, perhaps slightly more known as a talented and handsome Hollywood actor who's appeared in precious few films worthy of him. 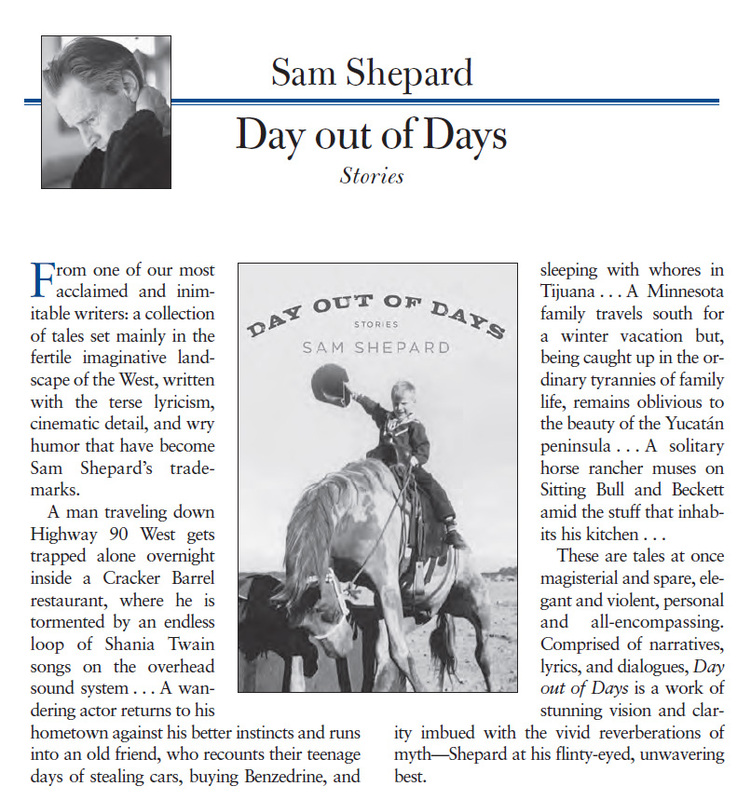 The narrator whose voice brings such coherence, charisma and intimacy to much of "Day Out of Days" shares Shepard's age and Midwestern roots, his wry world-weariness and several of his personal memories, while never feeling entirely shackled to the limits of Shepard's own biography. Fantasy can overtake the familiar at any moment, while never forsaking unflinching emotional clarity. These are stories about living long enough to recognize everywhere the shadows of your past without necessarily having the foggiest idea as to what it is that's casting them. With regards to geography and attitude these stories conjure distinctly American experience, and at times the sense of humour feels closest to the novels of Shepard's old friend Thomas McGuane, yet the hazy relationship between memoir and fiction is more akin to the work of Europeans such as W.G. Sebald or John Berger. Snippets of historical interjection deepen both the context and the loneliness at the book's core, and while Shepard occasionally falters with underwritten poetry or clichéd scenes of macho brooding, the book's meditative patchwork encourages us to forget the lapses. "Day out of Days" forms a pastiche of the cinematic cowboy at twilight, a thinker and drinker whose sadness and self-mockery and dismay save him from the preening self-importance that afflicts many of his peers; he's left knocking about eternally, like one of Dante's sinners, driving because he doesn't know what else to do. Maybe it's a country for old men after all. You're pretty sure you're in Sam Shepard country in his eclectic new collection when he mentions Sitting Bull, Seattle Slew, Henry Miller, hawks and hawk-faced Samuel Beckett - all on the first page. And when a man finds a severed human head, which asks a favor, there is no doubt... Like his earlier volumes, "Day Out of Days" resembles a mosaic, one with an uncertain, shifting pattern... But unlike his earlier collections, this book has more narrative continuity... 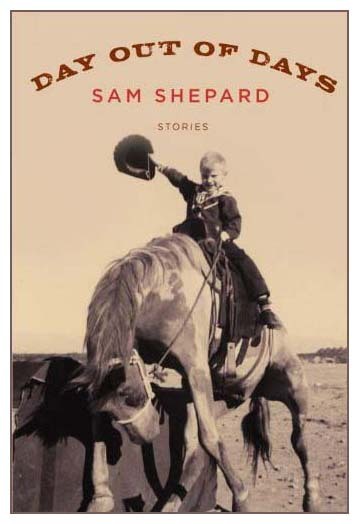 Throughout, Shepard offers glimpses of his liberal politics, of his fascinations with cowboy mythology, with music, with family and friends, with fast horses and waitresses. Evident, too: his career-long wonder at life's surpassing weirdness and an almost valedictory preoccupation with death. 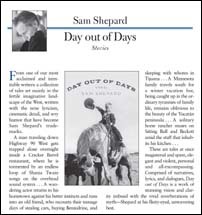 The short stories in "Day out of Days", Sam Shepard's new collection, have an unhinged, out-there appeal, reflecting their eclectic, mostly Western settings... With its quick shifts in perspective and place, this book adds up to a bizarre journey, but its frenzied style mirrors the darkly comic and disjointed nature of lives that, in the end, may differ little from our own.